This article was first published on 16 Jun 2017. When selecting flowering trees for your garden it is natural to focus on their flowering time. But equally eye-catching are the winter features of trees. 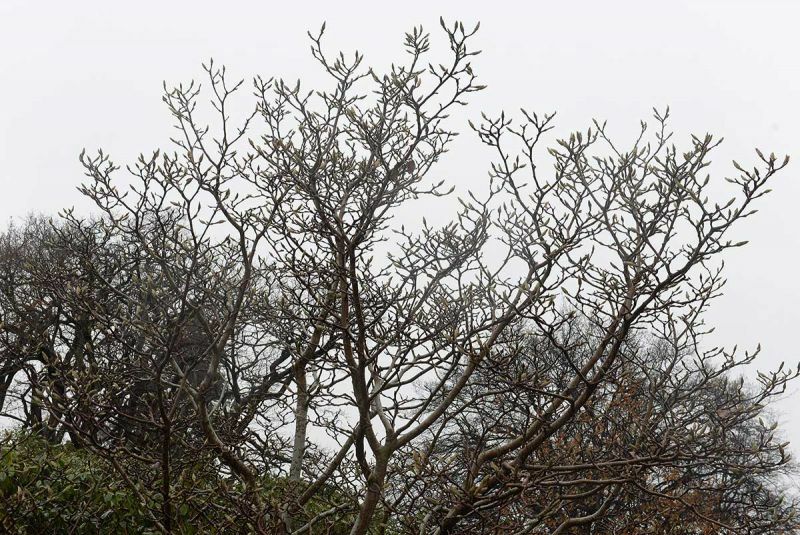 During the dormant months, branches and buds can create a stunning shape and structure. Magnolia 'Serene' is a good example of this. A lovely specimen tree reaching a height of five metres and width of around four metres, this tree has a great shape and outline when bare in winter. Right now, the velvety flowering buds are forming and there is the odd autumn leaf still attached to the stems that, in themselves, are also quite attractive. M. 'Serene' is an excellent choice for areas that are colder or prone to late frost. As it is a late flowerer and will bloom over a long period on naked branches, the large, deep rose coloured, bowl-shaped blooms really stand out. At this time of year most magnolias have lost their leaves. So at Dunedin Botanic Garden the impressive evergreen Magnolia grandiflora is planted nearby for contrast. Its lush, glossy, dark green leaves have the added attraction of an underside of rusty brown indumentum with a light furry feel. Large, fragrant, white flowers appear in late summer and autumn. This tree can reach up to 30 metres so needs a bit of room. Both these magnolias can be seen as you enter Dunedin Botanic Garden via the main Gardens Corner entrance. One is on the left and the other on the right of the paved area. Garden Life is produced by Dunedin Botanic Garden. For further information contact Linda Hellyer.